This contemporary of Praetorius worked in Weimar and Waldheim, and was in the midst of the Catholic-Lutheran split and the Thirty Years’s War. NOTE: All of the music on this program is from the 2 CD set of music by Melchior Vulpius. It features the Capella Daleminzia directed by René Michael Röder and is on the Querstand label, VKJK 1523. In 1596, the Wasungen-born Melchior Vulpius was called to Weimar as the cantor, music and Latin teacher at the municipal school and the St. Peter and Paul Parish Church (Stadtkirche). Thus he became the highest ranking Ernestine church musician and the expectations of him were equally high. Within some years, he created a considerable repertoire, which he published from 1602 onwards: He released a new collection almost every year until his early death in 1615 aged 45. Many of them found their way to the cantorial library in the little Saxon town of Waldheim where they were preserved until today. Since 2002, this musical heritage has been investigated and gradually made accessible to the public once more. 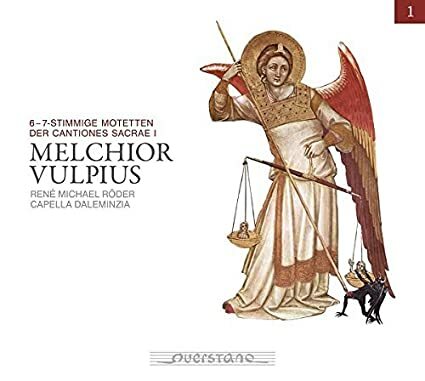 Waldheim’s cantor René Michael Röder and Capella Daleminzia directed by him have now started to release a CD series with the complete works by Vulpius. This double CD as Vol. 1 of the Melchior Vulpius Edition contains the 23 six-part and 5 seven-part motets of the Cantiones Sacrae I. These are mainly musical versions of psalms and Gospel texts. However, a jubilee motet is included as well celebrating the 5th birthday of Prince Johann Philipp of Saxony-Weimar who later would reign in the Duchy Saxony-Altenburg which had been split from the main Duchy Saxony-Weimar. The nine-part motet "Surrexit pastor bonus" for Easter Monday is the only one in this collection to be sung by four choirs and contains another special feature. While Choir 1 sings the Latin text, the Choirs 2, 3, and 4 contrast this with hymn in German language.